Concrete is a widely-used surfacing material in many landscapes. 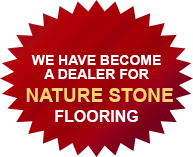 It is used extensively in features such as driveways, sidewalks, poolscapes, patios and more. Concrete is very resilient and can endure the elements well. However, over time, this surface can show signs of wear and tear too. One of the best ways to prevent early deterioration of your concrete surfaces is to get them sealcoated. If you already have a sealant on your driveway, idewalks etc., that has started to look dull and dated, it is a good idea to get the resealing done. DanTam takes care of resealing your existing stamped concrete regardless of the size of the space. 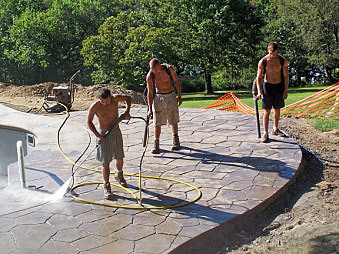 We are one of the most reputed companies in the stamped concrete field and cater to clients in Dillsburg, PA and the surrounding areas. We have been operating in this industry for almost 30 years and have the ability and skill required to provide tailored solutions to our clients. We understand that your concrete needs the right kind of protection, and we use a special acrylic-solvent based concrete sealer in our work. Protection from Climatic Changes and the Weather- Sealcoating locks out moisture and water, which helps prevents the surface from deterioration. Makes Maintenance Easy- The application deters moss and mildew from growing on the concrete surfaces and prevents rust and oil stains from sinking into the concrete. This eases the maintenance process for you and saves you a lot of time too. Saves You Money- Unprotected concrete surfaces are more prone to wear and damage. This also means you may have to get them replaced within a shorter period of time, which can prove to be very expensive. On the other hand, if you opt for our residential concrete resealing services at the right time, this can save you the cost of replacing the entire feature. 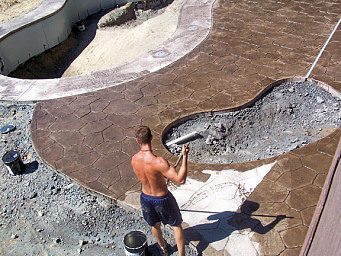 Aesthetics- The sealant significantly improves the appearance of the concrete surfaces in your landscaping. You can choose from matte or gloss concrete finishes based on your specific requirements, and these will add to the charm and beauty of your driveway, sidewalks or patio. 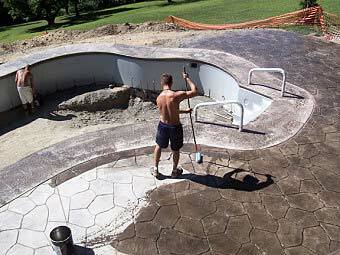 If you want custom concrete resealing solutions, feel free to contact Dan-Tam Concrete at (717) 528-7133. We are happy to give you an estimate based on our records to take care of this for you or we also offer DIY instructions. Please contact our office for more information. You can also send us your queries about our services via this Contact Us form and we will revert shortly to have detailed discussions about your requirements.